The following blog post was kindly prepared by Hind Kabaj & Andrew G. Mandelbaum. When in June 2014 SimSim-Participation Citoyenne launched the beta version of Nouabook.ma, Morocco’s first electronic platform for citizen-parliamentary engagement, the public reaction was mixed. Would members of Parliament (MPs) respond to citizens’ questions? Would citizens even care to ask questions of their MPs? According to a recent poll, just 7 percent of Moroccans feel represented in Parliament. Doubts that a platform to encourage dialogue between citizens and MPs were justified. We are pleased to report that, slowly but surely, both citizens and MPs are making good on the opportunity provided by Nouabook to engage in constructive dialogue. 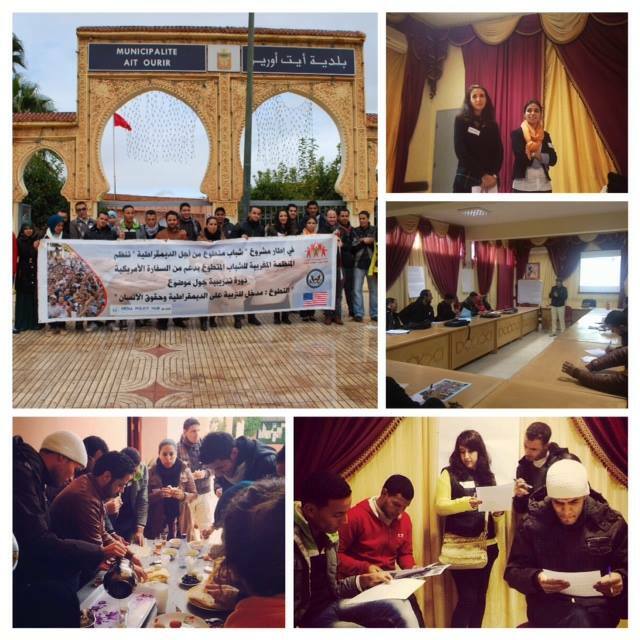 To date, Nouabook has received more than 160 questions from Moroccan citizens and residents. Of the 72 questions currently published on the site, MPs have responded to 30, for a response rate of over 40 percent. We expect this figure to increase as many of these questions are fewer than two weeks old. While Nouabook began with 11 participating MPs, the site now boasts a growing community of 24 MPs (including 12 women) from 8 political parties. Part of the initiative’s recent success is attributable to a spate of media coverage. On a recent Saturday, Morocco’s most widely read Arabic news outlet, Hespress, published an article about Nouabook. As a result, over 4000 individuals flocked to the site, posting more than 40 questions in a single weekend. A few days later, the official television station 2M reported on the project (see around minute 25:45) during its news show about the Moroccan Parliament. Nouabook staff on the 2M program مجلة البرلمان. To ensure the fluidity of questions and answers, Nouabook staff have adopted several key practices. We have realized that MPs are unlikely to respond to questions that do not pertain to their committee assignments. Consequently, we often ask citizens to re-submit their questions accordingly (and most happily oblige). In addition, we have taken to limiting the number of questions that any individual MP receives during each month. Most MPs do not have any staff support, so answering citizen questions can be a significant time strain. While the reaction to Nouabook has been largely positive, there remain any number of challenges, particularly in relation to the opacity of political culture. First, many MPs do not recognize the political value of engaging citizens online. Because most parties appoint MPs to electoral lists, many MPs feel indebted to party leaders, rather than to those who voted them (if indirectly) into office. A second challenge has been to promote access to the platform by the marginalized, including youth, women, speakers of Amazigh languages, the illiterate and those lacking Internet access (particularly those outside the main cities). We will soon provide citizens the ability to ask questions via video, which will further reduce barriers to participation. In the next phase of the project, we plan to address these challenges by enabling MPs to customize their Nouabook profile pages and to update citizens on their legislative work via video, photo and text. Building on a local event series we’ve conducted with partnering youth groups throughout the country, we plan to create a team of ambassadors who would assist those who are less inclined to participate to ask questions and to transmit responses. We also hope to host online town hall meetings between citizens and MPs, which will enable citizens to ask their questions through Nouabook and to have MPs respond via a live video feed on the Nouabook blog. Nouabook is part of the Poplus community that collaborates in the creation and use of civic technologies. Built on the WriteIt component, we welcome others to use our innovations and to help grow the community.